"Think of Light as giving form, not as spots of light and dark"
Earlier we looked at how we see form using the knowledge of how light works. Today I thought we could look at a way to use that information we gather and apply it in a systematic way as we to draw or paint what we see. 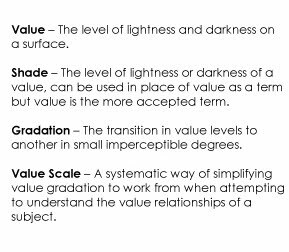 We see dark to light and all the gradations in between, and the gradations or shades are what we call values. The artist finds the value, the darkness or lightness of a surface, and takes that information to render the form. This is what gives size, shape, and depth to the form of the subject. We are all familiar with shadow and light, but it is the gradations of different value levels that gives us a sense of form. The value can be determined either by the local value of the area or by light effecting the surface.The darkness or lightness of the material of the surface may establish the value, such as a black shirt creates a dark value. How the light impacts the object will determine the value as well, such as the highlight from a bright light source will appear white on a dark surface. In a painting or drawing, usually the value is a result of the combination the two factors. Though you don't have to break down the value gradations systematically doing so will help guide you in finding the right value relationships you are looking to create. What you see displayed to the right and below are different versions of the value scale systems. The first is the most basic of scales, a three step value scale. This shows only white, black, and middle tone. Here, the middle tone, or mid-tone, is just the value that is half way between the white and black. That is to say, using this scale, if we mixed white and black together in equal amounts we would see a value that's visual level is half as bright as the white and half as dark as the black. Drawing just using three values, as in this scale, has its advantages and limitations. It is great for setting up compositions but is limiting when attempting to render realistic form. The values can be split into as many gradations or steps as possible, but it is not necessary to do so. The eye will see millions gradations of value, however you do not need to draw that many to convey the form of your subject. To the left, you will see an example of common value scale, a five step value scale. The value information in this scale will give you enough to work with to illustrate the form. It has the darks for shadows, the lights for highlight, and the halftones for the variations of the form in between. 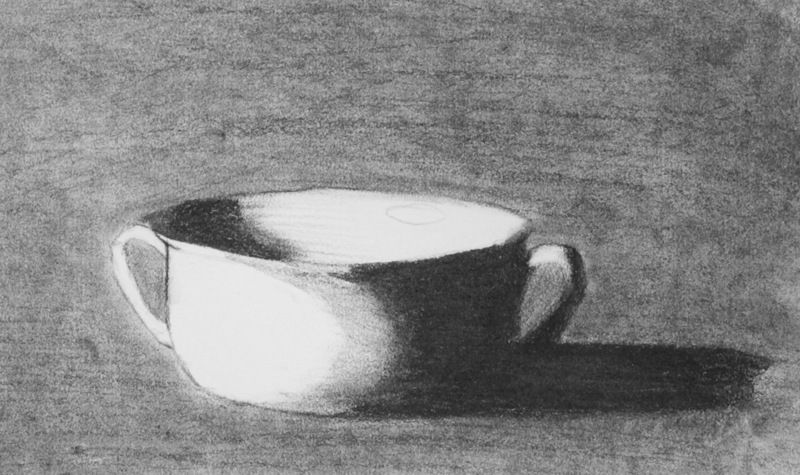 Cup drawn using five values. 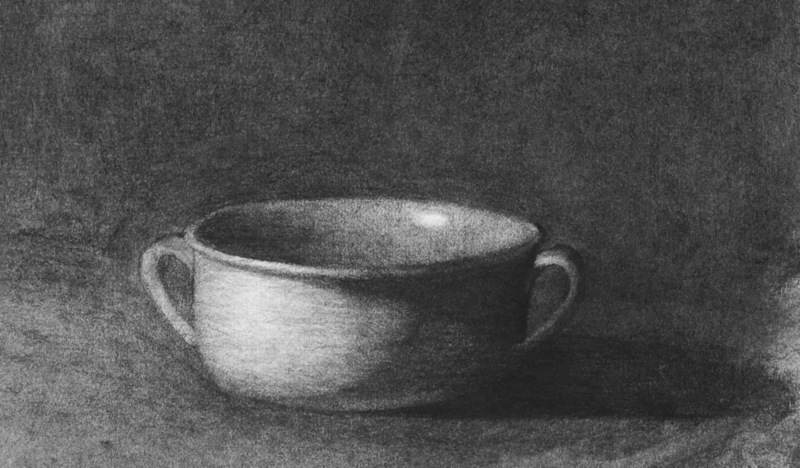 To the left, I have drawn a small cup using only five values. As you can see there is enough information for the eye to see the form of the cup. As mentioned earlier, you can separate the value gradations into as many steps as you want. Many artists use the next one I will show you. It is the commonly used nine value scale. Here I want to remind you that these scales are only used as guides to find the pertinent information to guide us in our work and really we see the value shifts not in clear steps but in fuzzy transitions. Cup draw with full value scale. This nine step value scale is a full range value scale that you can you use to believably render the form of the subject. A full range value scale is one with the lightest value being white and the darkest value being black. Not all drawings need to use the full value range but the use this range will give more control over creating depth and space. Here, I have draw the same cup using the full value scale. Middle tone running across a nine step value scale. This is a value chart where I ran the middle tone value (or mid-tone) across a nine step value chart to show you that it there is a relational nature to the values we see. Notice how the middle tone seems to change in relationship to the value next to it as it moves up the scale. In the white area and the values near it the mid-tone appears darker. Conversely it appears lighter in the black area and the values near it. Two more charts to have fun with. Here I present a question.Using the nine scale system, what is value of the circle in the middle for the first field? and the second field? The answer is to the right, they are both the same value. They just appear different based on the value field the circle is in. Value is a great descriptive tool, it will give shape, mass, and weight to the subject. Again, it is all based on the effects of light on an object. Studying the value interrelationship within the form will provide a great likeness when drawing or painting the subject.